It's free to crew, and all crew will receive a complementary meal ticket for the weekend. Any money left in the Falling Down bank account after we've paid for everything will be given to charity, specifically split between Mind and a First Nations charity in Quebec if we can find one. As before, the wonderful Crucible Catering will be providing five meals over the course of the weekend for all crew, and for those players who buy a catering ticket. There is no generally-available indoor sleeping accommodation on site. If you have specific access needs that mean you need an indoor bunk, please email us on gm@fallingdown.chaosdeathfish.com and we will do our best to sort something out using the few bunks on site. Otherwise, you will need a tent or similar to sleep in. We strongly encourage players to think about their character's attitudes towards confession, guilt and decisions. This is an entirely optional thing but it's particularly relevant to this event, as it is themed around human agency. 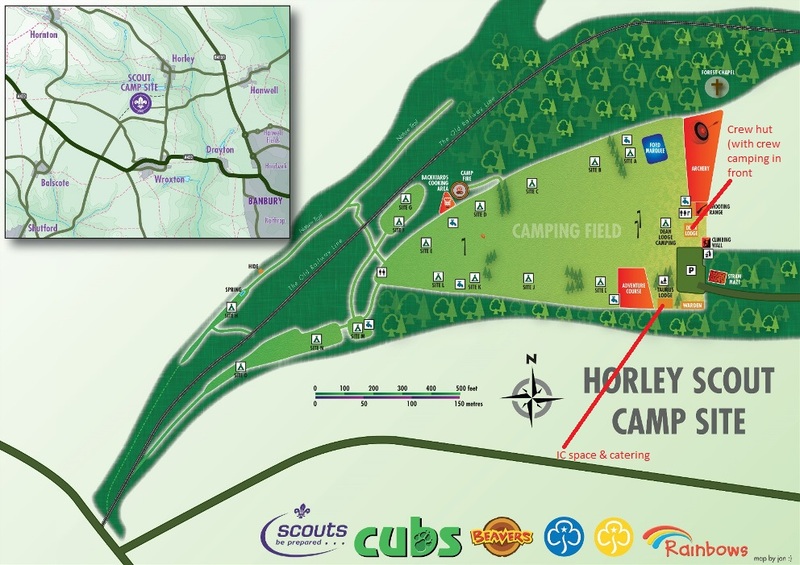 The event is being held at Horley Scout Camp near Banbury. Most players and crew will be camping - anyone who is sleeping in one of the limited number of bunks on site should already have received an email informing them of this. Everywhere else, aside from the toilet blocks and the chapel are considered IC areas; you should not store important IC items (like drugs or crafted items) in OC areas except when you are there as well. Most players will be sleeping in the IC area. If you are asleep during Time In, it is perfectly acceptable for someone to gently wake you and inform you that they have injured or killed your character. There is an open-air chapel that will be strictly off-limits at all times throughout the event. It will be clearly marked. Upon arrival on site, please come to the Dean Lodge, which is where check-in and Monster will be. Once you have told us that you’re on site, and received your character pack (containing any lammies, ribbons and drugs your character is entitled to), then you can get to work unpacking and getting into character. Please also bring your weapons along for checking at this point – we will not provide you with your check-in pack unless your weapons have been checked. Please note that we will not provide you with a reference card for your character's abilities, so please make sure you make any notes you think you might require! However, we will be supplying “show-me lammies” for some abilities - if you think you ought to have some, please check to make sure that you do, and ask a Guide for one if not! The kitchen in the Taurus Lodge is for the caterers only; crew will have access to the kitchen in the Dean Cabin. Tea, coffee etc. will be available throughout.